Thanksgiving is a time to give thanks for everything we have, but for some families, just having a turkey on the table is tough. Dallas Cowboy safety Kavon Frazier stopped by Hill Middle School on Nov. 16. Shelly Thibodaux, the Athletic Coordinator at Robert T. Hill Middle School on Easton Road, teamed up with a current and a former Dallas Cowboy player to make Thanksgiving extra special this year. They were able to donate 120 Thanksgiving meals to families of students who attend Hill Middle School. “It serves our students and their families,” said Thibodaux. 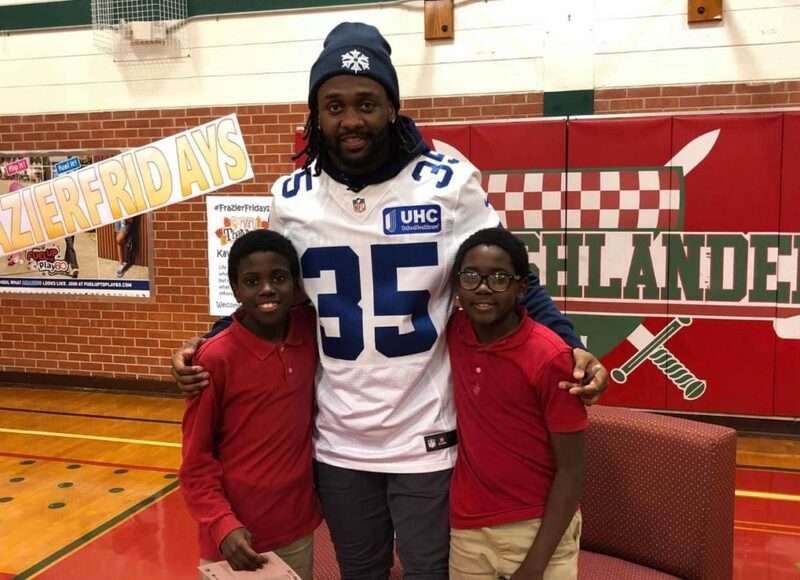 Dallas Cowboy safety Kavon Frazier stopped by Hill Middle School on Nov. 16 as part of his Frazier Friday program and did not come empty handed. Frazier was at the school at part of his Frazier Cares Foundation handing out 20 turkey meals, courtesy of Albertsons, to students and their families. He did not just drop them off but spent a lot of time with the students and coaching staff by answering questions, signing autographs, and taking photos with the students. “It was awesome because you see all these rich people who don’t care about giving back, but he is not one of those,” said seventh grader Thomas Fitton. “I really appreciate it,” said seventh grader Keiontay Marsh. The additional 100 turkeys were donated by the Eugene Lockhart Foundation. Lockhart, a former Dallas Cowboy and a graduate of the University of Houston, is a former college classmate of Thibodaux and has been donating turkeys for several years. Students, staff and the Boy Scouts of America donated other Thanksgiving items in a food drive held the week before Thanksgiving break. During the Thanksgiving break, staff members including Rochelle Grant, Antony Park, Tita Pasion and Dallas ISD Board of Trustees for District 3 Dan Micicche delivered the donations to 100 Hill Middle School families. This is the fourth year turkeys have been given to students’ families at Hill Middle School. The first year they only had four to give out. They hope next year they can help even more.